Description: The Most Worshipful William J. Bray will be with us for the 3rd degree at Lemon Grove Lodge THIS THURSDAY the 17th. MW Bray is the Grand Master of Masons in California. Grand Master William Bray is a Scottish Rite Mason 33' Inspector General. Lodge opens at 6:30 Mason. Lemon Grove puts on a GREAT Third Degree - it will be well worth attending. (Also be prepared to eat a scrumptious meal afterward!!). The Honorable Richard Chavez KCCH is our Ambassador there. Ladies and Brethren please update your summer events in the San Diego Divisional Website. If you would like to begin posting events to the site fill out the optin box to the right or call the number below. If your group does not have a category please do not hesitate to give me a call at 619-462-4290 to create one for you. Description: There will be a Masonic Funeral Service for WB Verlyn \"Blackie\" McMahan at Lemon Grove Lodge on February 13, 2010, Saturday at 1pm. Masonic Funeral Service for WB Verlyn "Blackie" McMahan will be at Lemon Grove Lodge on Saturday, February 13, 2010 at 1pm. There will be a Masonic Service for WB Verlyn Blackie McMahan at Lemon Grove Lodge on Saturday, February 13, 2010 at 1 pm. WB Verlyn “Blackie” McMahan – R.I.P. Comments Off on WB Verlyn “Blackie” McMahan – R.I.P. Today is a sad day for Lemon Grove Lodge and it is with a heavy heart to inform each and everyone that our WB Verlyn "Blackie" McMahan has reached the end of his earthly toils due to medical complications at Kaiser Hospital-Zion this morning at 11:40am. He was 85. Masonic Services for Worshipful Blackie is being scheduled at this time. We are having a 3rd Degree Conferral for Bro. Oswald Cruz and all Master Masons are invited to attend. Refreshments to follow after the degree. We are having a 3rd Degree for Bro. 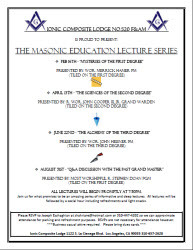 Errol Alindogan at Lemon Grove Lodge and all Master Masons are invited to attend. Refreshment to follow after the degree conferral. J L Shell Daylight 837 Stated Meeting @ 10am. Luncheon w/Ladies & guests @ 11:30am.